Hilton Brussels Grand Place: In The Heart of the City — Now That's a Honeymoon! The capital of Belgium and the seat of the European Commission, the city of Brussels is world famous for its beers, chocolates, and its Gothic and Baroque architecture. For two nights we stayed in Brussels and our weekend a la honeymoon at the Hilton Brussels Grand Place made for a perfect getaway in this sprawling city! Located right across Bruxelles-Central Station, it goes without saying how excellently convenient the hotel’s location is! It’s a 5-minute walk to Grand-Place and Mont des Arts. Nearly everything you'll want to see in Brussels is packed in this highly touristy yet really lively area. The prime location is very much worth staying at the Hilton! We arrived quite early for check-in but nonetheless the staff greeted us warmly and wished us a happy honeymoon! Our King Junior Suite with Lounge Access was located on the 6th floor. As we entered the room, we were surprised with how spacious the room was. Yes, it’s a suite so you might think it’s meant to be huge. But by European standards, considering dense metropolitan areas commonly have small living spaces, an elegant 60-square metre suite is a commodity! Upon entering the room, there was a small receiving area. To the left was a full storage cabinet, on the right was a high receiving desk where we often left our room keys. The suite features a king bed, an office desk, and a living area with a comfy couch. Our room was situated at the corner of the building, so the windows were at an angle appearing like skylights. We had a view of the square below and Bruxelles-Central Station. There was a big event during our weekend stay so we were also able to see a concert stage setup just at the bottom of Mon des Arts. 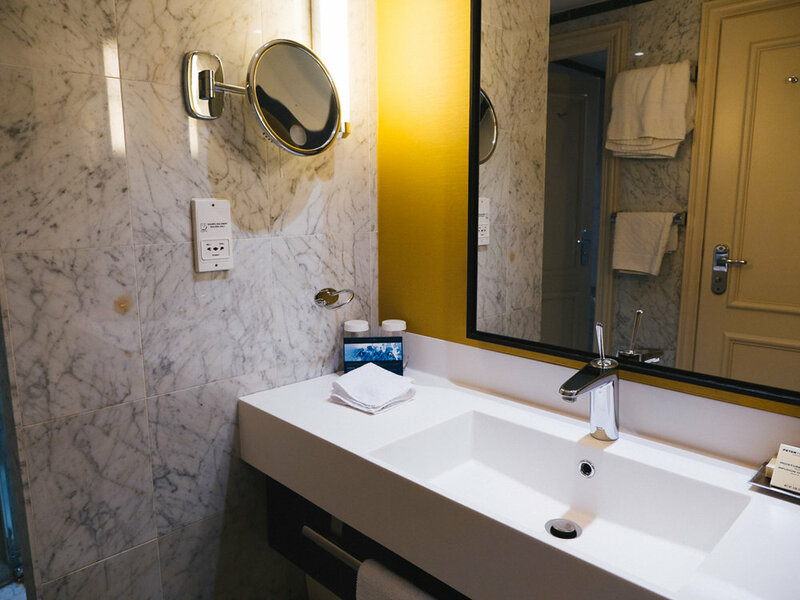 The stylish bathroom comes with a full bathtub, separate rain showers, and separate toilet. We simply love bathtubs that can accommodate two - it's just what honeymooners need! Bath products are by Peter Thomas Roth. Hilton Brussels Grand Place celebrated our honeymoon with us by leaving a surprise at the living area. We were spoiled with a bottle of Prosecco and a box of Godiva chocolates! The staff also left us an adorable note - it was the sweetest thing! Who wouldn't want to be taken care of this way when on your honeymoon? Thank you, Hilton! Apart from being a Hilton Honors member, staying at the King Junior Suite granted us Lounge Access. The Executive Lounge is on the ground floor just after Concierge. With its casual atmosphere and a beautiful view of the outdoors, it was relaxing to enjoy a few drinks and snacks at the Executive Lounge. The Lounge is also connected to the Restaurant where breakfast is served. We loved that we can order waffles, too! Given its oh-so-perfect location in the heart of Brussels, we’ll definitely come back at the Hilton Brussels Grand Place. The staff were friendly and helpful without being too chatty, gave us recommendations on where to get the best moules-frites in town, and of course arranged a special surprise for celebrating our honeymoon. Traveling to Belgium soon? See the latest rates!